Wooden Garden Sheds - Who Has The Best ? Wooden garden sheds are a style icon, and they’ve become part of the fabric of British culture. Mention the United Kingdom to people abroad and they’ll picture a person happily pottering about in their timber shed, and the best part about it of course is that it’s an image that’s absolutely true. There’s a very wide selection of garden sheds available to buy online today, so how do you find the wooden shed that’s just perfect for your garden? Don’t worry, we’re here to help you find just what you need with our WhatShed guide to the top 20 wooden garden sheds available to buy online in the UK today. There are a huge amount of wooden garden sheds out there, encompassing everything from small pent stores to large timber buildings. When compiling our list we’ve concentrated on sheds that are built with the garden in mind, rather than being primarily wooden workshops or log cabins. We’ve also considered many factors when deciding the order: from price to practicality, and from design to durability. That means there’s a shed for everybody, however much you have to spend. It’s time to find out what makes the WhatShed list of the top 20 wooden garden sheds available online in the UK right now. Well done to the Shed-Plus heavy duty double door combination shed; by combining a generously proportioned shed with a secure storage area, it deservedly takes first place in our list of the 20 best wooden garden sheds available to buy online in the UK today. Whether you’re looking for a wooden shed, a summer house, a PVC greenhouse, or any other garden building, WhatShed bring you the reviews that help you make a wise and informed choice. 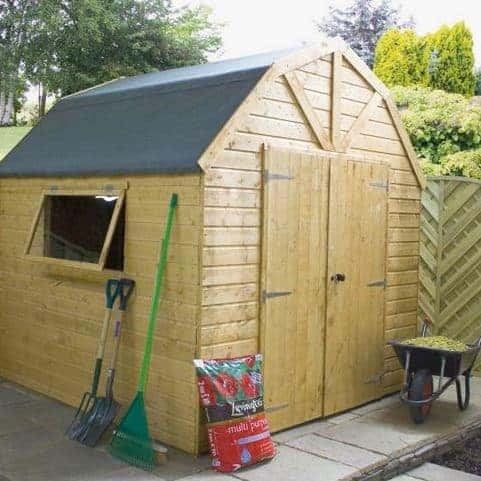 Wooden garden sheds come in all shapes and sizes, and we’ve represented this within our WhatShed guide, and yet when a shed is both very large and represents very good value for money as well, it’s sure to catch our attention. That’s why this heavy duty garden shed makes it to the very top of our list, even with a price tag that may put some people off. It’s designed to be very tough and durable, and it certainly achieves that with tongue and groove cladding used for all surfaces, not just the walls. It’s also been pressure treated, as have the integrated floor joists, which is one reason that the manufacturer has been able to provide a very generous 15 year warranty against rot. What we liked most about this large timber shed, however, is that it has a secure storage area at the rear. Whilst the main body of the building has fully braced double doors and two windows with toughened safety glass, the rear section has no windows and is accessed by its own single personnel door. This makes it a very secure area, as nobody will be able to see if anything valuable is kept inside. 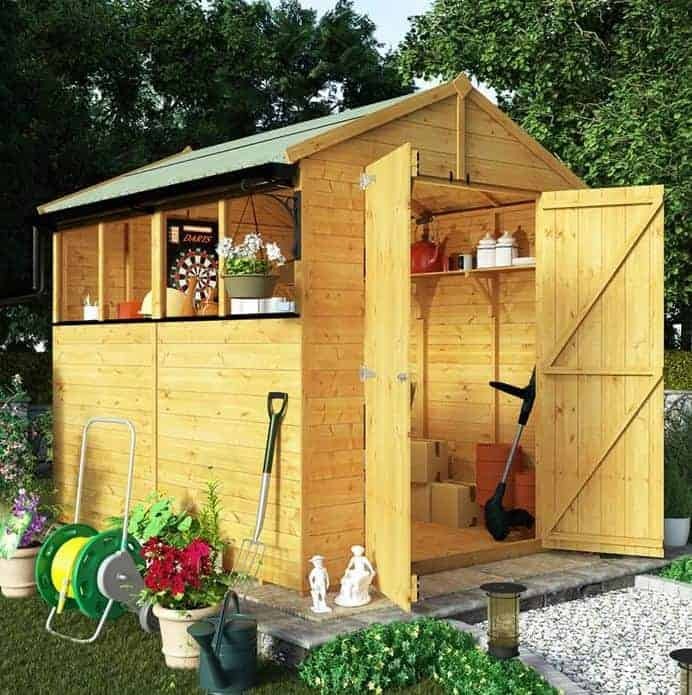 It’s a very useful extra feature that takes this to the number one position in our list of the best wooden garden sheds available today. 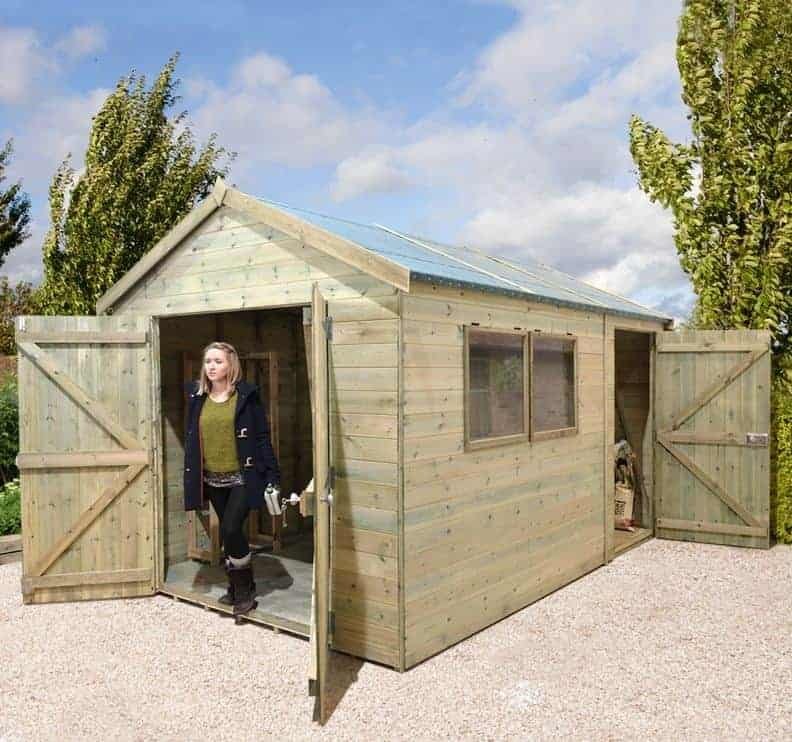 This is the largest of the wooden garden sheds to feature in our league table, and whilst there are of course larger timber buildings available, we feel that those are primarily workshops whereas this is still ideal for use as a shed that can fit into a medium sized garden. It also means that Shed-Plus have taken the top two positions, but that’s because we were impressed by the build quality, durability, and attention to detail. Once again a pressure treatment has been applied to all the timbers, and this gives the tongue and groove cladding long lasting protection as shown by the inclusion of a 15 year warranty period. 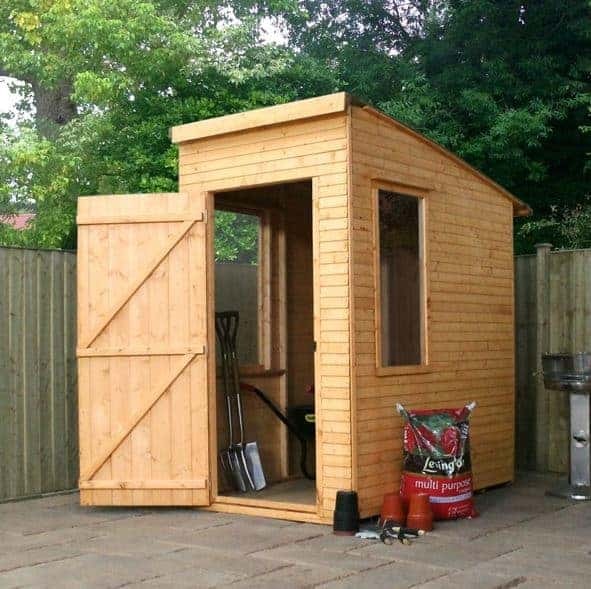 This is a wooden garden shed that’s large scale in its own right, with a base width of 3.35m, a base depth of 3.63m, and a generous height of 2.54m. What makes this stand out from the crowd, however, is the additional canopy and log store. 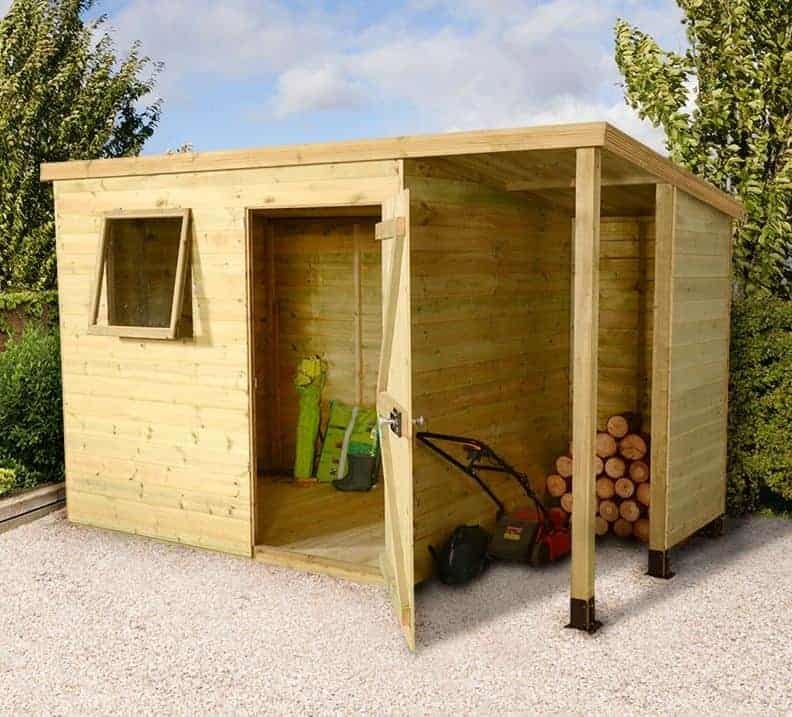 This includes a weather proof enclosure that’s perfect for logs and firewood but could also be used for gardening materials such as soil or sand, and this leads onto an open area protected by the overhanging apex roof and supported by heavy duty 75mm posts. The result is a garden building that’s both very stable and very versatile, which is why it reaches number two in our best wooden garden sheds league table. We’ve now gone from the largest of the wooden garden sheds to make our top twenty, to one of the smallest. Another differentiating factor is that it features overlap cladding whereas the vast majority of the timber sheds on this list feature tougher tongue and groove cladding, and yet this still makes the top three. The reason for this is that it’s not only ideal for people who have a restricted amount of space in their garden, it also represents outstanding value and is therefore a great choice for those who are working to a tight budget. The shed itself has a width of 1.82m and a depth of 1.81m, but this width includes the overhanging roof which has a peak height of 2.01m, so the interior has considerably less room. Nevertheless there’s still more than enough space for garden tools and even a lawn mower, and we really liked the lean to feature, as it’s a convenient place to position your equipment while working in the garden. The apex roof and overlap cladding both effectively stop water penetration, and the fight against rot is also helped by the use of a pressure treatment. We wouldn’t have expected to see either a pressure treatment or the 15 year warranty on a shed of this price, and yet we did. 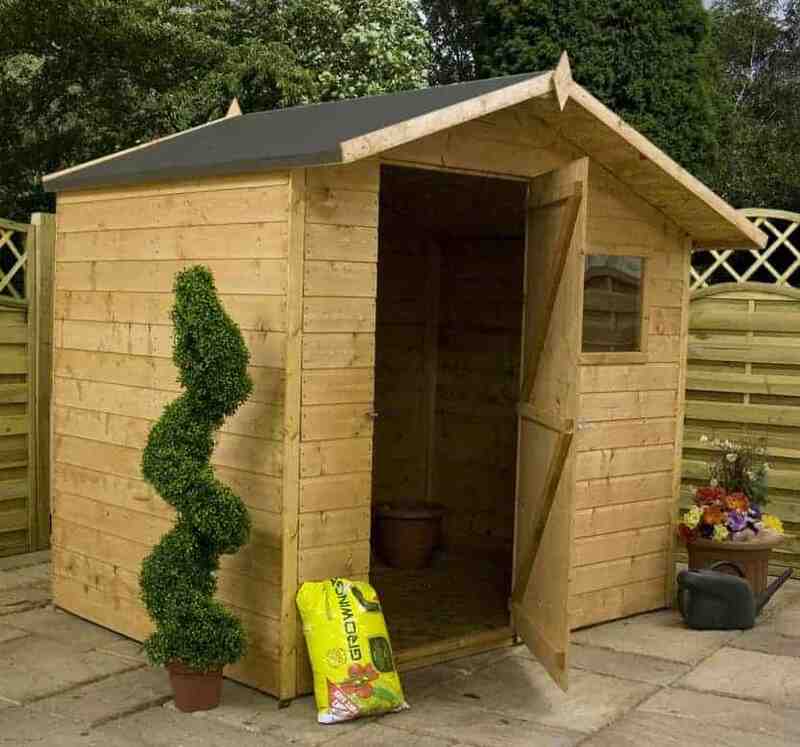 That’s what gives this such a high position in our list of the very best wooden garden sheds. We now have another compact garden shed, and this one is even more affordable. It doesn’t feature a lean to, but instead follows the conventional apex roof design that many people associate with wooden garden sheds. This means that the base dimensions of 2.02 X 1.22m can be more accommodating than you might imagine, especially as the double hinged doors make it easy to move items in and out. We were pleased to see, at this very affordable price, that tongue and groove cladding had been used for the walls, which in conjunction with the apex roof means that rainwater simply slides away. A dip treatment has been used on the timbers, which means that while the 10 year warranty is very welcome it is reliant upon annual retreatments; this shouldn’t be a difficult task on a shed of this size. What really separates this from other wooden garden sheds, and lifts it to this lofty position in our top 20, is its unique design with small windows set at the very top of one side. This means that you get the benefit of natural light in the interior, but at the same time passers by will be unable to see what’s kept inside. It’s a very useful added feature if security is one of your prime concerns, and yet the price is still under two hundred pounds. This eight foot by eight foot wooden garden building has a style all of its very own, as it’s built in a Dutch barn style. We found it very aesthetically pleasing, and it means that not only will you get a mid sized shed that’s very well constructed, you’ll also gain a garden feature that’s sure to impress your visitors and neighbours. We also like to see wooden garden sheds that retain their practicality while offering something a little different, and that’s what gains it a place within the top five of our WhatShed league table. Instantly noticeable is the felt covered four sided roof, but whilst it looks more attractive than a standard apex roof it’s just as effective at keeping water at bay. It’s also one of the tallest roofs we’ve seen on a garden shed, creating a peak height of 2.60m and lots of headroom. The cladding itself is made of tongue and groove, and we were pleased to see that applied to the floor as well. The double doors are wider than we often see on a shed of this size, and allow easy access the interior which has dimensions of 2.50 X 2.40m. 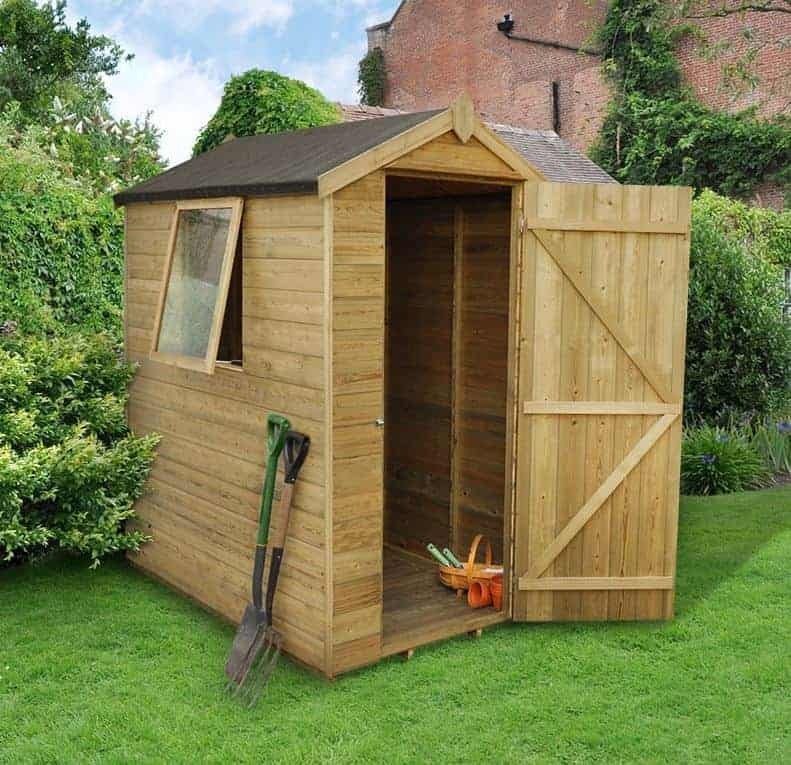 A 10 year warranty is applied, and whilst this is more expensive than some sheds of similar dimensions, it’s good looks and extra vertical storage space mark it out as one of the best wooden garden sheds. We’ve reviewed lots of wooden garden sheds from within the BillyOh range, and this one in particular provides excellent value for money whilst still being very spacious and versatile. 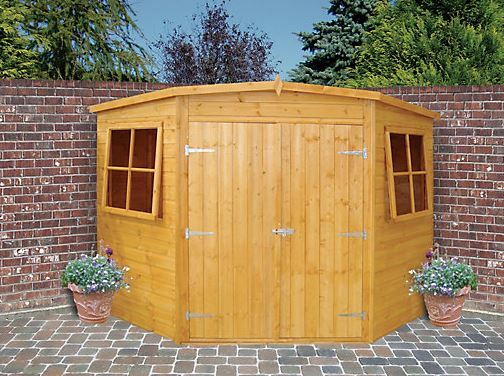 If you want a large garden storage facility but don’t want to spend upwards of a thousand pounds, then this traditionally styled apex shed could be exactly what you’re looking for. With a width of 2.52m and a depth of 3.53m, with a very accommodating height of 2.35m as well, it provides a base area of well over 90 square feet and yet has a price tag of less than seven hundred pounds even with a 10 year warranty on the tongue and groove cladding. It’s not only the surprisingly low price point that stands out, as the main feature that catches the eye is a bank of six windows that completely take up the upper portion of one side. Two of them can be opened as well, which means that the interior is flooded with natural light, and can easily be ventilated on a hot day as well. 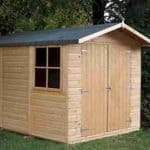 It creates a very pleasant environment to spend time in, which is why we feel that this is one of the best wooden garden sheds to carry out a hobby, or even small scale business activity, in. 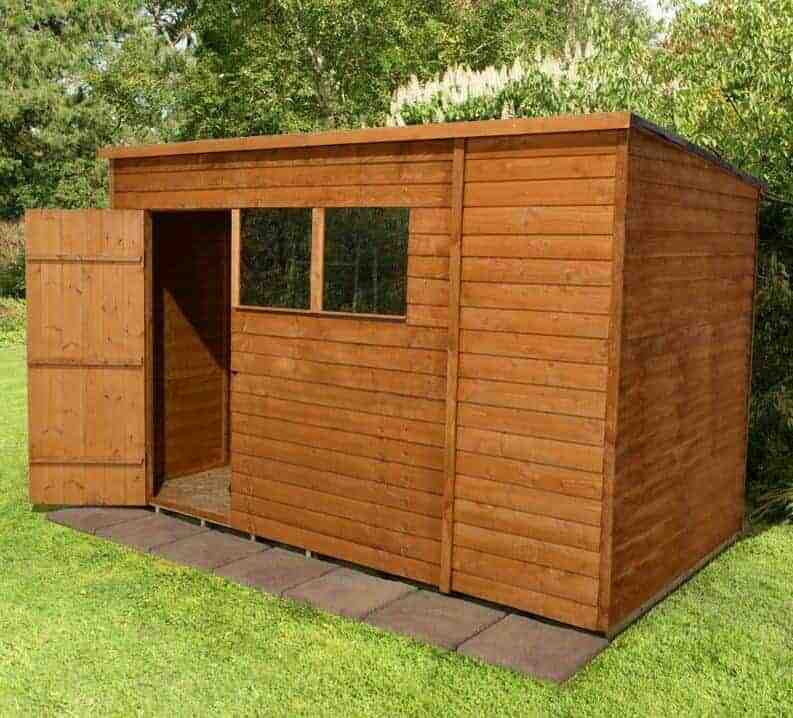 This is not the cheapest 6′ X 4′ garden shed, which stops it being placed even higher up our top 20 league table, but it does have striking looks, and it even contributes to a very good cause. The Woodland Trust is a charity that is committed to protecting British woodland and planting more trees, and for every sale of this particular shed they receive 5% of the price. Whilst this is an initiative that we welcomed, it’s not enough in itself to promote the building into the WhatShed list of the best wooden garden sheds, but thankfully this has a lot more to offer as well. We found the looks very eye catching, with the smooth curve of the roof truly unique, and it’s sure to become a talking point. Almost as striking are the two long windows on either side, which are not only decorative they also ensure that the interior is very well lit when the sun is shining. 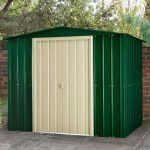 With base dimensions of 2.10 X 1.25m this is one of the smaller sheds we’ve reviewed, yet it can still be a useful storage facility for a moderately sized garden. The tongue and groove cladding is significantly thicker than most that we see on small sheds, at 16mm, and is covered by a 10 year warranty. If an attractive appearance is one of your main considerations when looking at wooden garden sheds, then this could be the one for you. 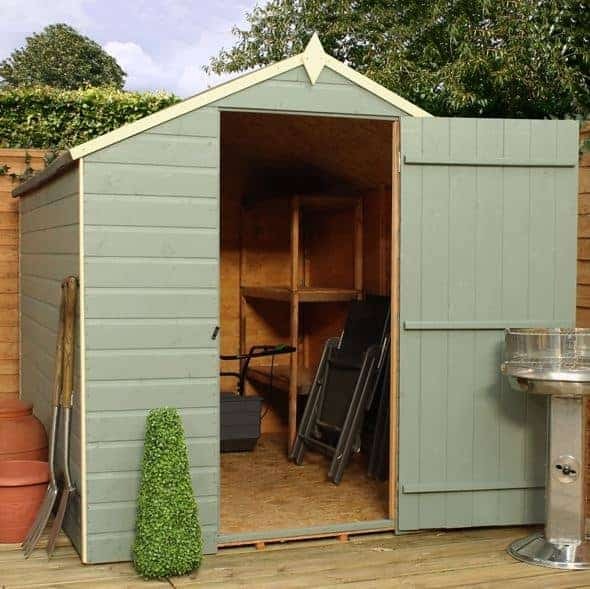 There are many factors that determine the overall value of the wooden garden sheds we review, but we would expect to pay more than three hundred and fifty pounds for a shed with a base area of over 60 square feet, even if some cost saving measures have been taken. One example of measures taken to reduce the cost to the customer for this pent shed is that overlap cladding has been used for the walls, and at the same time OSB sheeting has been used for the roof and the floor. This means that whilst the shed feels stable when assembled, you may wish to reinforce the floor if you plan on storing anything heavy upon it. Added value is given by the provision of a 10 year warranty against rot, although as with most dip treated sheds the customer will have to add their own preservative treatments later. Nonetheless, we sometimes see some sheds that are much more costly with no warranty period at all, so this was a welcome addition. We also liked the inclusion of floor joists to lift the floor above the threat posed by ground moisture, and we liked the two fixed windows which being made of styrene are tough, reliable and very shatter resistant. If you’re interested in great value wooden garden sheds with a good amount of space, this model is certainly worthy of your consideration. 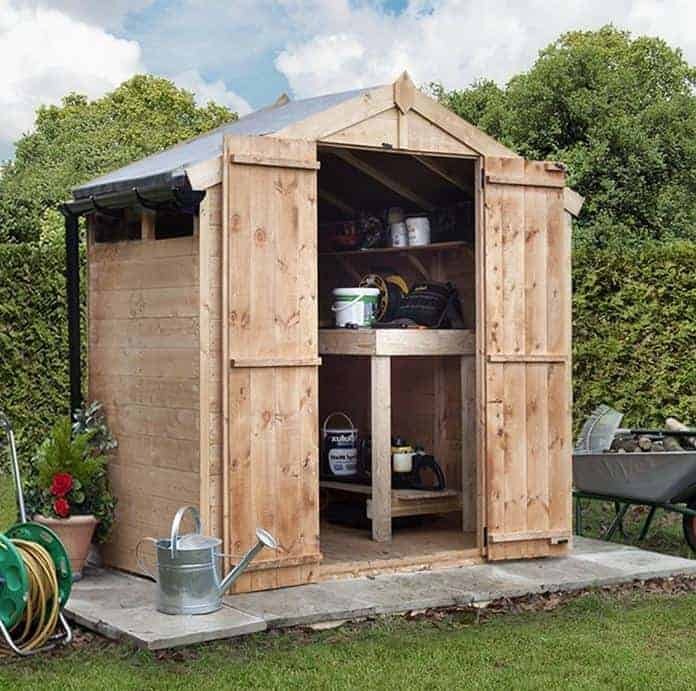 We’ve reviewed wooden garden sheds in all shapes and sizes, yet we find that corner sheds can be some of the most useful garden buildings of them all, and this is the highest placed example in our top 20 league table. Garden space is at a premium for many people, and whilst they’d love the benefits that a durable timber shed can bring they may not want to give up lawn or bedding space. This is an ideal solution, as whilst it offers a very accommodating interior storage capacity it fits neatly into the corner of a garden of almost any size. The base size is 2.03 X 2.03m, but of course the interior is cut down because of the corners on the five sided design. Even so it’s easy to fit a lawn mower and a good selection of tools inside, and at 2.33m this is one of the highest pent roofs that we’ve seen. There’s even lots of head room when walking in and out, as the single hinged door has an opening height of 1.80m and a greater than average width of 0.89m. There’s also lots of light inside, thanks to its two opening windows that have toughened glass. 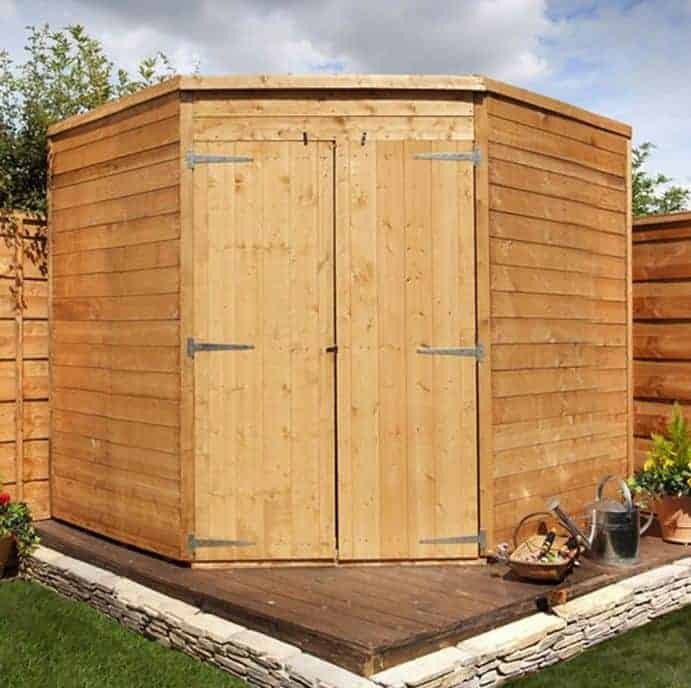 With a heavy duty tongue and groove floor, pressure treated timbers and a 15 year guarantee as well, this deserves its place in our top 10 wooden garden sheds even though the price tag may put some buyers off and so prevents it from being ranked higher. Our list of the best ten wooden garden sheds is rounded off by a shed that faithfully follows the classic apex shed design, but that’s no bad thing after all as it has endured for a reason. The apex roof itself, which on this shed reaches a ridge height of 2.05m, quickly carries rain and snow away rather than allowing it to sit on the surface, while there’s also protection from moisture of a different kind, thanks to the integrated floor joists. We were pleased to see that the floor joists had been pressure treated, as had the timber as a whole, and with tongue and groove cladding used across all the surfaces it means that it carries a 15 year guarantee which is as long as any that we’ve seen. Because the treatment is so long lasting, it also means that the customer isn’t required to carry out their own annual treatment, although we still advise inspecting it yearly. With an opening window included as well, there’s lots of ventilation available whenever needed as well as a plentiful amount of natural light that makes it easy to find items that have been stored. 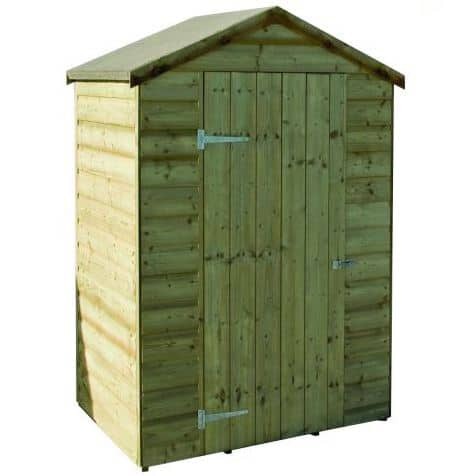 We feel this represents excellent value for a base size of 1.14 X 1.78m, and it’s this factor that raises it above many other wooden garden sheds. We always appreciate wooden garden sheds that are designed with value in mind, and as this is also built to a high quality specification it deserves its place within our list of the top 20 wooden garden sheds. 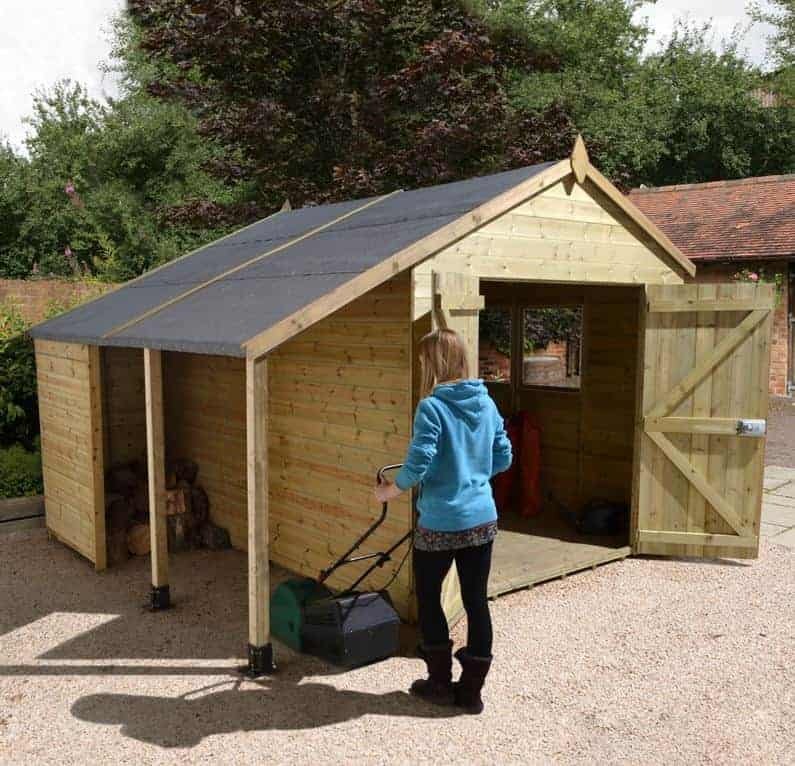 For a price of less than three hundred pounds you get a lot of shed for your money, with a width of 1.78m and a depth of 2.37m, even though the apex roof isn’t the tallest we’ve seen, with a ridge height of 1.94m. We were pleased to see, at this price, that the walls consisted of tongue and groove cladding with a fairly standard thickness of 12mm. The roof is made of more cost effective solid sheet material, but as this is then topped with a strong sand felt covering it should be very effective at keeping water out. The effectiveness of the shed as a whole against weathering and rot is shown by the inclusion of a 10 year manufacturer’s guarantee, although the timbers have been dip treated rather than being given the long lasting protection of a pressure treatment. 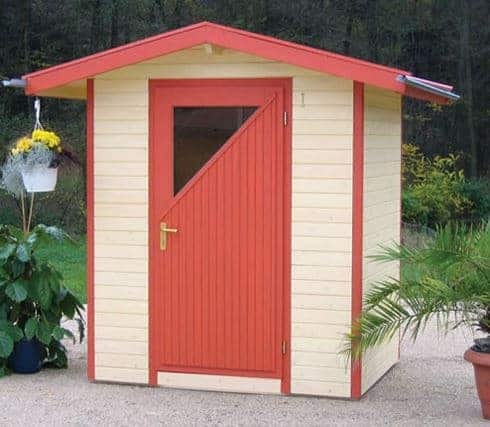 We sometimes review sheds that, even at the premium end of the market, have had no preservative treatment at all, so we feel that this still provides very good value for money for people looking for small to mid sized wooden garden sheds. This may be one of the largest wooden garden sheds in our WhatShed league table, but despite its name it’s more than suitable for use as a traditional garden shed as well as being usable as a small scale workshop. It’s this versatility that leads to it gaining its position within our top 20, and whatever use it’s put to it still supplies the good value for money that we’ve come to expect from the BillyOh sheds we review. 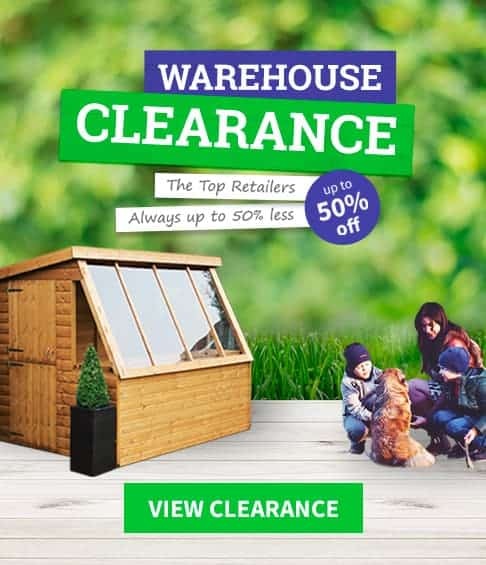 There are different sizes available within this Greenkeeper range, but with a base area of a hundred square feet we feel this will particularly appeal to those looking to upgrade their garden storage, leisure, or work space. 12mm tongue and groove cladding is used throughout, and we were pleased to find that the framing is slightly thicker than average which is always useful in a relatively large wooden building. One feature we particularly liked was the profusion of safe styrene windows; there are six positioned around the shed, and four of them open to allow fresh air in whenever desired. The only downside is that this comes without a floor as standard, although it can be fixed directly onto a flat concrete base, so this is why it isn’t further up our list of the best wooden garden sheds. More and more people are discovering the advantages of using logs for fuel, both to their pocket and the wider environment. 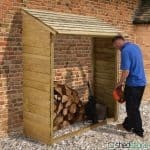 If you have a log burning fire or stove, then a log store is a must have garden building, but by combining it with a well built shed as well you can get even better value. That’s exactly what this durable and flexible garden building provides, and as we also found it to be surprisingly good looking it takes its place among the top 20 wooden garden sheds. The main body of the garden shed is to the left and has a pent roof, which means that although it still channels rainwater away it doesn’t look too tall or obtrusive. There’s one opening window, which is something we always like to see as ventilation can be essential on hot days, and a braced single door. The door also has a key operated rim lock built in, which isn’t something that we always see on the wooden garden sheds we review and creates a much more secure environment. The log store itself is to the right, and whilst the canopy roof gives rain protection there’s still an open front that allows air to circulate and dry out the logs. This isn’t the cheapest garden building on our list, but as it’s also pressure treated and comes with a 15 year warranty it has a lot to offer. One of the advantages of wooden garden sheds is that they make an ideal shelter if you’re in the garden when a rain shower arrives. 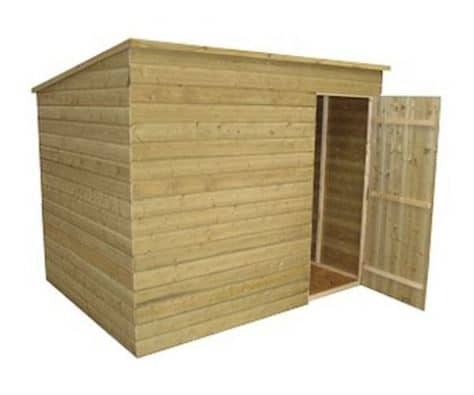 This particular shed is perfect for that purpose, as it has a ridge height of 2.15m which means that there’s more than enough room to stand up in, as well as a width of 2.26m and a depth of 1.84m. One extra feature that gives it added value is that the apex roof overhangs to provide a slight canopy, which gives a shaded area outside the single hinged door, as well as extra protection from the rain. Rain protection is one of the features of this shed, as the tightly interlocking tongue and groove cladding is excellent at keeping rain out. That’s because it’s slightly thicker, at 14mm, than we usually see, and that extra 2mm makes a noticeable difference to strength and stability. As the timbers have been dip treated by the manufacturer they will require annual retreatment by the customer, but they still come with a peace of mind giving 10 year guarantee. 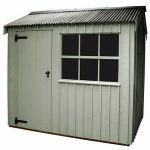 With thicker than average styrene also used for the glazing on the one fixed window, this is a tough yet affordable entry in our run down of the top 20 wooden garden sheds. Some of the wooden garden sheds in this top 20 league table stand out for their beauty and serve to enhance their garden environment, but we recognise that many people want a shed that’s functional rather than for its form. There are also people for whom privacy, which brings with it enhanced security, is the prime deciding factor when buying a garden shed and for such people this could be the ideal purchase. It’s pent design means that it can be hidden away behind a wall if required, even though the ridge height is still a useful 2.00m, and it has absolutely no windows so you won’t feel worried about having valuable tools or equipment on display to passers by. The walls have been constructed from tongue and groove cladding, and it was good to see that they had been pressure treated. This gives long lasting protection to the timbers, and so whilst it comes with a 10 year warranty, we wouldn’t be surprised to see it last much longer without any appearance of rot. Oriented Strand Board has been used for the roof and the floor, which has helped to keep the cost down. 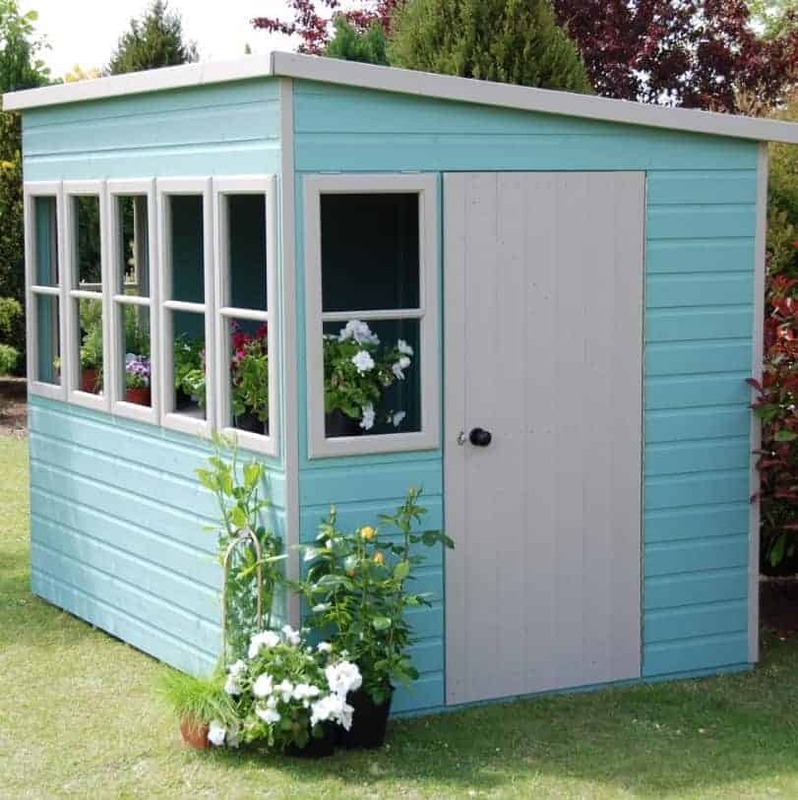 This still feels tough and stable, and with no windows it has a tough appearance as well which many people find a real advantage in wooden garden sheds. Sometimes it’s good to have something unique, after all if you take a lot of time to create a garden that stands out from the crowd for all the right reasons, why shouldn’t your garden buildings be the same? Now it’s possible to have bespoke wooden garden sheds that are sure to attract compliments as well as being a very useful addition to your garden. There are two things that we particularly liked about this shed: one is that even though we’ve reviewed a huge amount of timber sheds this has a look all of its own, and the second is that it’s very customisable, which is something that we always welcome. Its base dimensions are 1.8 X 1.8m, which is approximately six foot by six foot, so it isn’t the largest that we’ve seen, and the relatively high price tag accounts for it not being placed higher. Nonetheless we liked the overhanging apex roof with guttering, and especially the slightly elevated door with a unique piece of triangular glazing. It’s supplied unpainted, but there’s an option to have it painted in colours of the customer’s choice, meaning that it can make a bold statement. With 19mm tongue and groove cladding used throughout, this brings a touch of class and sophistication to our top 20 wooden garden sheds. We always appreciate the practicality that comes with a corner shed, as they allow the property owner to make the most of an awkward and unused corner of their garden. 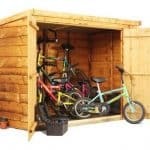 In effect they’re a space saving device, and as this Wickes shed is constructed from high quality materials and is reasonably priced for an eight foot by eight foot building, it gains a place towards the latter end of our list of the 20 best wooden garden sheds available to be bought online in the UK today. It has a pent roof with decorative finial at its peak, and even though it follows a very traditional design we still found it to be a good looking addition to the garden. That’s in large part because it features smooth planed shiplap cladding that has an autumn gold colouring. There are also two windows on either side of the double doors, each featuring attractive Georgian style cross hatching. We were pleased to find that both windows can be opened, but there were two other features here that we don’t always find on the wooden garden sheds we review. Firstly, there’s an integrated key operated lock, and secondly the 34 X 34mm framing is slightly thicker than we often see, leading to a robust and reliable corner shed. This may not have the good looks and decorative features of some of the wooden garden sheds that we see from this manufacturer, but it makes up for that by including some features and advantages that many of its more outwardly appealing cousins don’t possess. For starters it encompasses the always useful five sided design which allows it to be tucked away into a corner of a garden. It also has absolutely no windows, which we know that many people prefer in small or mid sized sheds as it adds to their overall security. At the front are two double doors which open to a width of 0.58m, so when opened there’s easily enough light to store and retrieve items without difficulty. We were also pleased to see that a floor had been included as standard, rather than being an optional extra as we often see on other BillyOh wooden garden sheds. Made of tongue and groove cladding, just as the walls and the pent roof are, it’s tough enough to walk on and to take heavier items of gardening equipment without any problems. 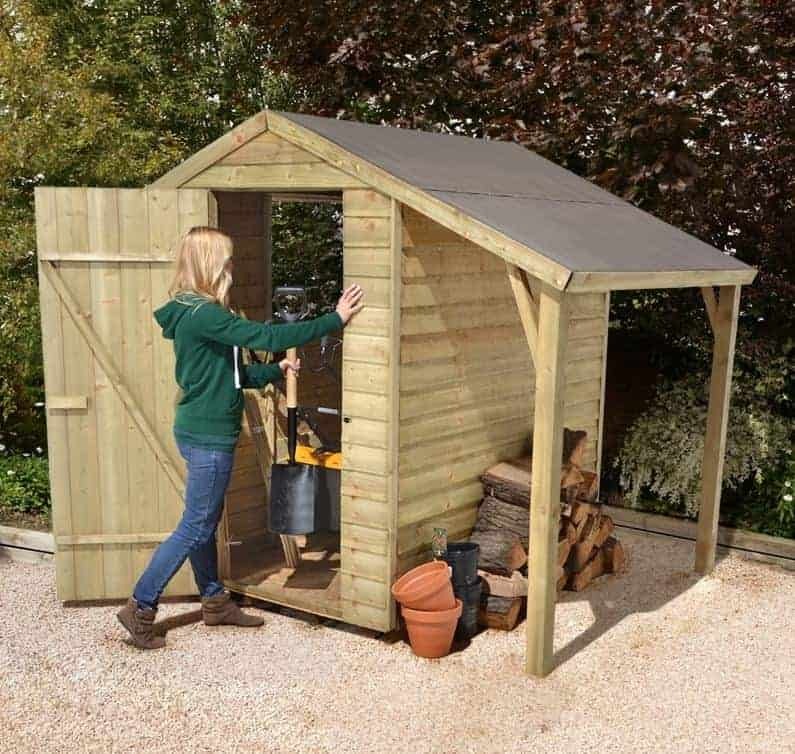 This isn’t the cheapest shed we’ve reviewed that has base dimensions of 2.10 X 2.10m or similar, but with a 10 year warranty as standard we still feel it has enough to offer to make our list of today’s best wooden garden sheds. 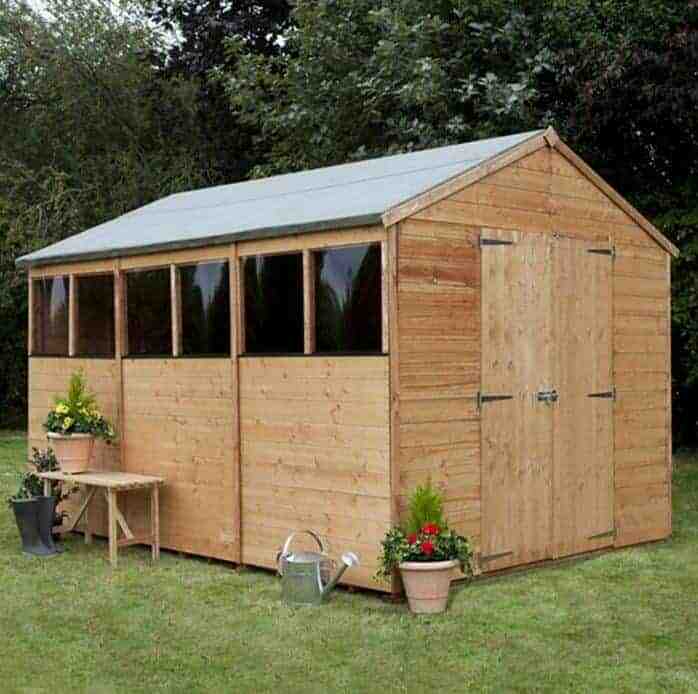 This is one of the best looking pent roofed wooden garden sheds that we’ve seen, and only its relatively high price when compared to other eight foot by six foot sheds prevents it gaining a position much higher up our league table. If the price falls within your budget, therefore, this should be given serious consideration. It caught our eye from the moment we saw it, and when of the first things we noticed was that the pent roof is more pitched than many that we see, which is good news as it means that rain and snow are more quickly carried away. The feature that most impressed us however was the profusion of glazing, with four opening windows dominating one side of the building, and another window positioned adjacent to the heavy duty single hinged door. It means that there’s a lot of light inside, although as glass is used rather than styrene care must be taken not to accidentally shatter them. The door itself features a key operated lock, and as a preservative basecoat has been applied a 10 year warranty is provided, although this is dependent upon the customer keeping on top of the treatment schedule as is usually the case with the dip treated wooden garden sheds we review. It has to be said that this will win no prizes for beauty, and in fact is one of the plainest timber sheds that you’ll ever see, but in a way that’s one of the benefits that has elevated it into our top 20 wooden garden sheds. 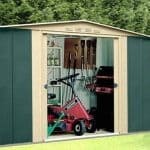 Shed crime is perceived to be on the rise, so if you want to store items of value in your garden shed it’s essential to have good security features in place. A padlock set can be bought along with the shed for less than ten pounds and easily fitted, but the best security feature is the lack of windows which means that opportune criminals will have no way of knowing if it’s worth breaking into and are therefore much more likely to pass by. When delivered this shed has a greenish tinge, which we were glad to see as it’s a sure sign that the tongue and groove cladding has been pressure treated. This not only creates an extended warranty period, it saves time and money that would otherwise be spent on annual treatment schedules. 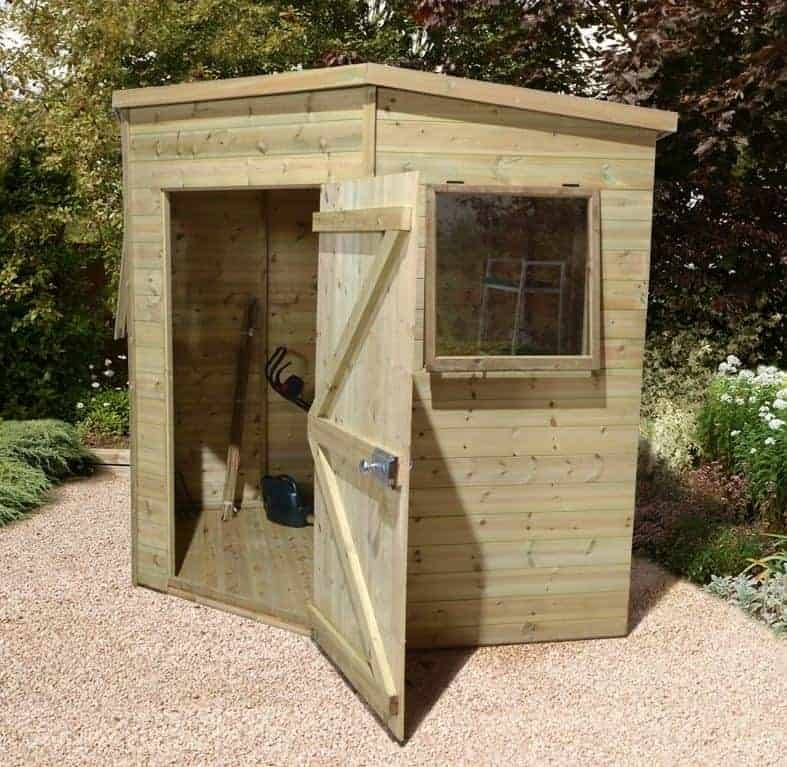 With a width of 1.39m and a depth of 0.94m this is the smallest of the wooden garden sheds that make our list, but it’s also the cheapest and with its durability and in-built security we feel it deserves its place.